Ingredients: Sweet corn cream style - 1cup, water - 4cups, ½ carrot, ½ capsicum (finely diced), cabbage (finely chopped) 2-3 tbsp, chilli sauce 1tbsp, vinegar 1tbsp, cornflour 2tsp, salt - pepper (to taste). 1. Mix together american corn, water together in a saucepan and bring to boil. 2. Add salt, pepper to taste. 3. Also add vinegar & chilli sauce & simmer it stirring in between. Also add chopped veggies & bring to boil. 4. 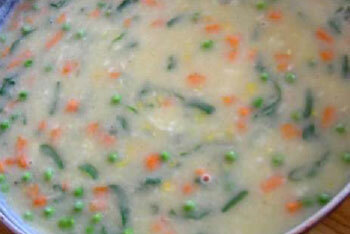 Mix cornflour in 1/2 a cup of cold water and add to boiling soup. 5. Cook it till thick.